When considering any changes to your face, make sure to consult a true specialist. The last thing you want is uncertainty when it comes to outcomes and results. The field of facial rejuvenation has advanced substantially over the past decade, and a large variety of surgical and non-surgical options are now available. Although surgery is typically more effective and longer lasting, the results from non-surgical treatments can be quite impressive. There is no single definition for a laser facelift. Some physicians will use this term to describe a regular facelift, which utilizes a laser for some portions of the procedure just as a scalpel would be used. Others use this term to describe a facelift combined with laser resurfacing of the skin. Some physicians will use the term laser facelift to describe deep skin heating techniques, which can give some of the improvements you see with a classic facelift. Dr. Talei uses the term laser facelift to describe a non-surgical lift performed by using the most effective tightening device on the market to date – the Profound, by Syneron-Candela. By coupling microneedling with radiofrequency thermal energy, you can obtain amazing results. The Profound can treat the face by improving wrinkles, lines, drooping, pore size, rosacea and even acne. The machine also has the ability to tighten the neck and shrink fat while elegantly contouring the cheeks and jawline. This treatment has had a 100% patient satisfaction rate in our practice. This is as well as in clinical studies, which cannot be said for most other devices. Although you can’t really compare the results to advanced facelifting techniques, such as those performed by Dr. Talei, the response we have seen from patients is quite impressive. Patients are ecstatic with their improved skin quality and rejuvenated appearance. Most patients are complimented on having lost weight as well. When further skin resurfacing is required, Dr. Talei will combine this treatment with fractional laser skin treatments. 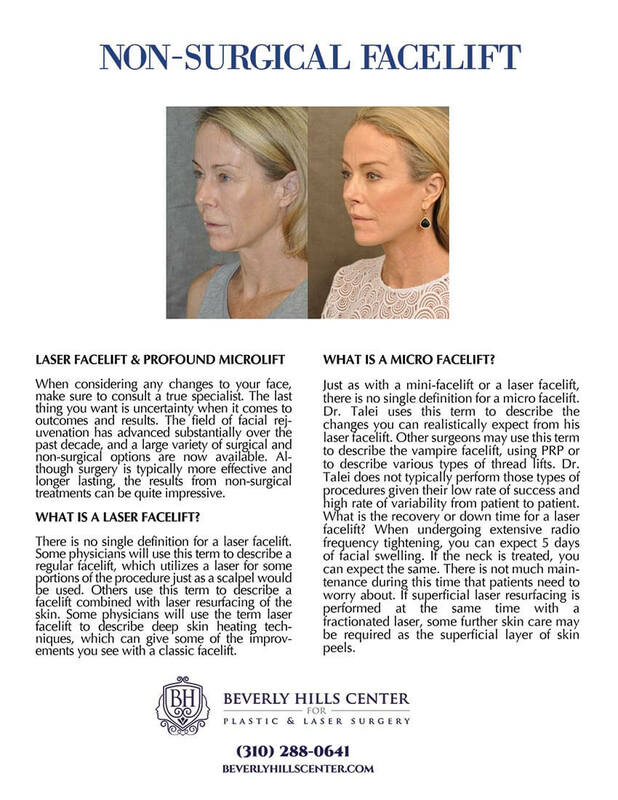 What is a Micro Facelift? Just as with a mini-facelift or a laser facelift, there is no single definition for a micro facelift. Dr. Talei uses this term to describe the changes you can realistically expect from his laser facelift. Other surgeons may use this term to describe the vampire facelift, using PRP or to describe various types of thread lifts. 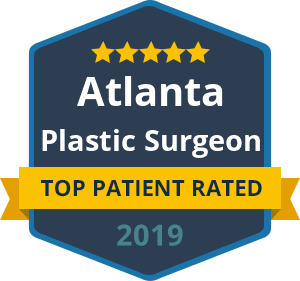 Dr. Talei does not typically perform those types of procedures given their low rate of success and high rate of variability from patient to patient. What is the recovery or down time for a laser facelift? When undergoing extensive radio frequency tightening, you can expect 5 days of facial swelling. If the neck is treated, you can expect the same. There is not much maintenance during this time that patients need to worry about. If superficial laser resurfacing is performed at the same time with a fractionated laser, some further skin care may be required as the superficial layer of skin peels. When will I see the results of a Laser Facelift? The improvement in skin quality can be seen after 1-2 weeks and will continue to improve over the next year. The tightening and contouring of the face and neck start to show at 3 weeks and continue to improve over the next year as well. The improvements seen with almost all other devices are typically due to swelling seen in the face, which is why they only last 6-8 months on average. How long do the results for a Laser or Micro Facelift Last? Results and improvements seen with most devices on the market last only as long as the swelling lasts. Most patients report that they see an improvement only for 6- 8 months, if they see one at all. With the Profound MicroLift, the results are more apparent and have been reported to last around 3 years. The microneedling technology bypasses the limitations seen in other devices. In order for a treatment to be effective, it must deliver energy into the deep layer of the skin. Most ultrasound and radiofrequency devices do this by sending energy through the superficial layer down into the deep layer. This limits the amount of energy delivered, as too much would burn or damage the superficial skin. The Profound fixes this problem by bypassing the superficial layer and targeting the deep layer directly and precisely with insulated microneedles. This is why the results are so much longer lasting and more impressive.